Suite: How do I cancel or break apart my Suite? On the next page, scroll to the bottom to find the Cancel link. Once you click this link, you’ll be presented with options to keep some of your accounts and get rid of the rest. 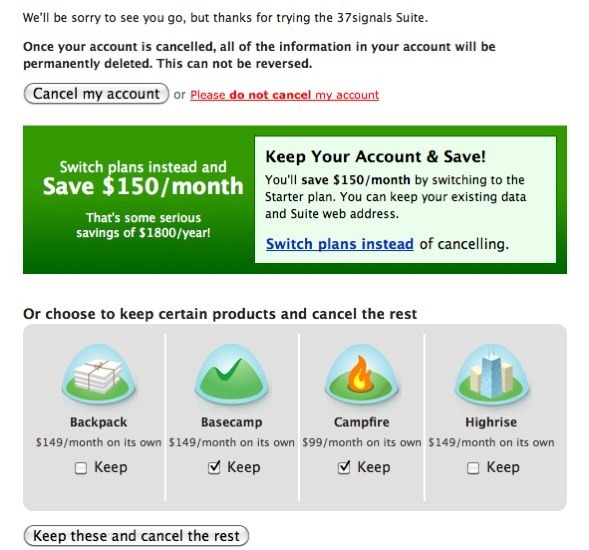 If you want to keep Basecamp, you’ll want to check off “Keep” under Basecamp. NOTE: Cancelling your account splits up all your accounts and makes them separate again. Billing and user management will now be individual for each account you keep.